West Allegheny School District has been monitoring elementary enrollment trends over the past several years to assess the need for reassigning elementary boundary lines to ensure balanced school enrollment and equitable academic programming. At this time, there is a clear need to address a significant demographic shift that has resulted in Wilson Elementary kindergarten currently enrolling 115 students, compared to McKee Elementary at 62 and Donaldson Elementary at 89. 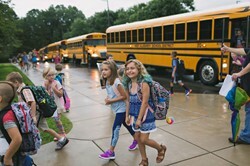 This trend is expected to continue with 2021-2022 kindergarten through fifth grade enrollment totals at Wilson, McKee and Donaldson Elementary Schools forecasted to be approximately 657, 466 and 511 respectively. Recognizing this shift, the District has worked closely and collaboratively with demography experts to evaluate 15 distinct realignment scenarios with multiple variations. The District took into consideration family impact, academic programming, teacher effectiveness, functional capacity, financial impact, enrollment stability and long-term feasibility with a concentrated focus on providing equitable and robust learning opportunities for all students. After a yearlong review, a redistricting plan emerged that supports the District’s value in neighborhood schools and allows students to attend school with students from their neighborhood. This plan was presented to the Board of School Directors at the October 10, 2018 Property and Supply Committee meeting and will be voted on by the end of the year. Please see the supporting documents to the right to learn more about the 2019-2020 Elementary Redistricting Plan. Questions may be directed to: redistricting@westasd.org. Responses to inquiries will be provided within four school days.